Concept Art for the Egg-Seltzer found in Mirage Saloon Zone. Concept Art for the Swivel Stools found in Mirage Saloon Zone. Concept Art for the electric powered ceilings interacting with the Lightning Shield found in Flying Battery Zone. An early concept for one of the pages of the exclusive San Diego Comic Con Manual. Features a prototype sprite for Tails airlifting Sonic, also seen in some pre-release video footage. This sprite featured a much more exaggerated facial expression with Tails' cheek puffed out in exertion, which some people misinterpreted as a large, creepy smirk. Tails' face was redrawn with a much less exaggerated expression prior to the game's release. The zipline handle Sonic is holding onto is differently coloured, appearing to comprise a loop of vines with a wooden handle. In the final game, the art is recoloured so that the loop is metal and the handle purple, presumably to provide better contrast against the trees and other foliage found throughout the stage. These colouring changes also extend to the circular connectors at each end of the line - the earlier version is metal with a green outer rim, but the final version is purple with a metal outer rim. The ziplines are also depicted with this early colouring on the promotional artwork produced for the game's vinyl sountrack release. Another shot featuring the earlier wooden ziplines. There are also some rough tile layouts visible, such as the zipline clipping through the wall above it and a gap in the tree's trunk where the spiked log crosses it - these were fixed for the final release. This screenshot features a prototype sprite for the Heavy Gunner, missing the golden "HBH" star badge in the centre of its chest, though this detail was present on the official artwork released alongside early screenshots of this boss. The badge is present on the Heavy Gunner's sprite in the final game. Another shot featuring the early Heavy Gunner sprite. A still from an early version of Act 2 with an earlier revision of the background. The middle section is the most different, featuring more rows of monitors as well as pink and blue coloured lights and columns which are absent from the final version's background. In the final, much of this is replaced with curtains and a window through which a single row of monitors can be seen, and some sort of large reflective surface. The giant mixing desk in the lower background is also arranged differently, with only a single row of dials etc. before the giant knobs and buttons begin, rather than three more spaced-out rows as in the finished background. Finally, no area matching the one seen here exists in the finished stage - this area can briefly be seen in motion in the game's initial announcement trailer. Another view of Act 2 with the same early background. The lotto machine is also different, lacking the "Gallop Lotto" logo and rainbow surround seen on the final version. Two spinning bars in a "+" shape show the central ball's movement - in the finished game this is reduced to a single horizontal bar. Though not much of the surrounding stage is visible, this again appears to be an area not found in the final game - as with the previous screenshot, it can briefly be seen in motion in the game's announcement trailer. One last still from Act 2 with the same early background. As well as the changes noted in previous screens, the foreground monitors in this shot are displaying blank white; in the final, these display the "EGG TV" logo animation on a loop, which has a scanline effect even on the blank white frames. An area similar to this, though not identical, appears near the end of the finished stage - as with the previous screenshots, it can briefly be seen in motion in the game's announcement trailer. Many pre-release screenshots featured differently colored tiles, with a grey interior. This was the case in the original stage from Sonic & Knuckles, but in Mania it was the subject of complaints, arguing that it didn't fit with the rest of the game's spritework. It was changed to dark purple for release. The pipework beneath the ground is laid out in a horrendously broken manner just like in the original stage. 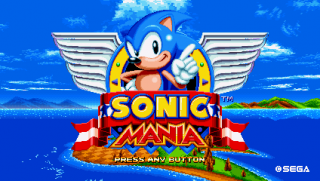 This was eventually fixed for Mania's version prior to the game's release. The top of these collapsing platforms has a glitched palette. This section is different in the final. These platforms have black corners, which were made transparent in the final. Pre-release videos of Chemical Plant lacked the palette cycling and background pylons the original stage had. This was fixed for release. The background is missing some animation. Prototype screenshot of Press Garden Zone Act 1, featured on a display at the licensing expo held in Las Vegas on May 22nd, 2017. Possibly a mock-up, as no HUD is present and no area exactly matching this one appears in the finished stage. This screenshot features several differences with the final stage: The large ramps found throughout the stage are coloured differently, with the ramp itself grey and the connectors at the end copper; these two elements have had their colouring swapped in the final stage. The foliage on the ramps is also red like the rest of the foliage in Act 1, rather than green as in the finished stage. The highest background layer featuring the animated printing presses appears to be completely absent. Finally, the white column in the flooring to the left extends right up to the white floor tiles - these are rarely placed directly beneath the floor in the finished stage, and in the rare instances where they are a band of the ornate green under-floor tiles always separates them from the floor itself. The platform on the far-right of this screenshot is home to a line of rings in the finished stage, the leftmost of which would normally be visible when the camera is in this position. While it's possible the ring has simply already been collected, this would involve climbing the Beanstalk, collecting the rings and then backtracking onto the leaf platform again. This page was last edited on 10 February 2019, at 07:44.